My career as a photographer for the escape room industry started almost from the first day escape games appeared in Russia. 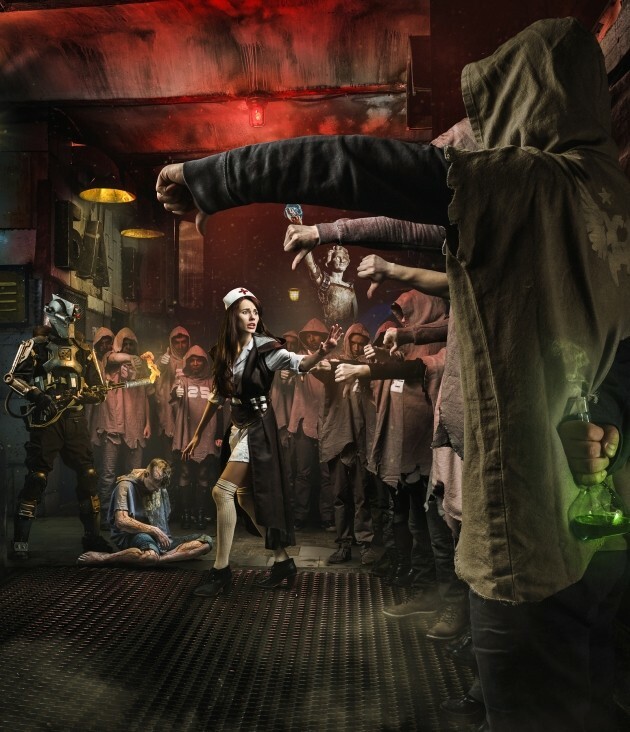 In December of 2013, Claustrophobia, which is now the largest escape room franchise in the world, launched Moscow’s first two escape rooms and hired me to take promotional photos for their marketing materials. 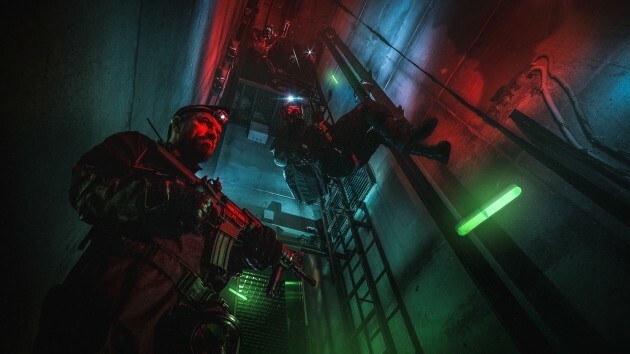 Soon, the shooting style I’d developed for Claustrophobia had caught the eye of numerous competitors, and many of them began attempting to replicate it. However, their efforts often failed to capture the same atmospheric qualities that my methods did. The qualitative difference was in approach and attitude. Competitors focused on copying a single style without realizing that for each new location, I essentially started over from scratch. For every new game I shot, the objective was to create something unique – something with its own individual soul. So even now, I’d argue that images of Claustrophobia’s rooms are the best in terms of price and quality. It is important to understand that quality business photos are a unification of many factors, and simply hiring a good photographer is not enough. 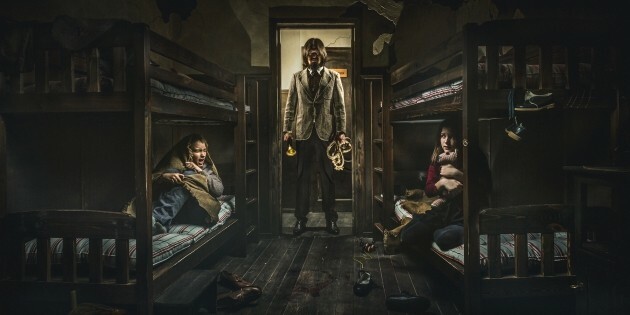 Even if you don’t have a large budget for promotional photography, following these four rules is essential to creating effective escape room photographs. A snapshot taken with your phone from the doorway of your escape room is not going to highlight the game’s best qualities. Think about what your target audience is looking for in an escape adventure. Yes, they know they’re in a room built for the purposes of playing a game. They know they aren’t really trapped or in danger. 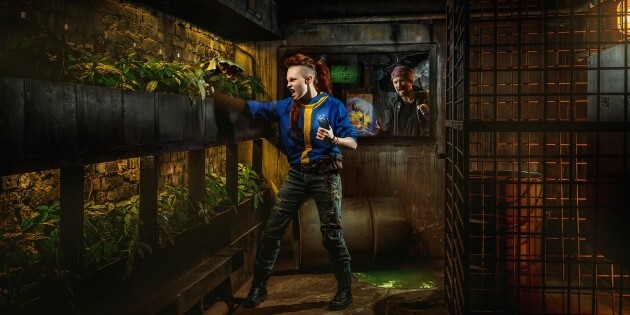 But they want to imagine that they’re in the environment you’ve promised, whether that’s a Medieval dungeon or a space station in an alternate dimension. So, the photos of your room shouldn’t look like a stage set of a dungeon or a space station – they should look like what they’re supposed to be. Think of it like you’re creating a poster for a movie. You wouldn’t go to a feature film with a poster that just showed the movie set in regular lighting with no indication of what kind of story occurs in it. So why would you expect an escape room customer to try your game if you advertise it with equally unremarkable images? Escape room photos should grab the viewer’s attention with both setting (the image) and story (the implied adventure). 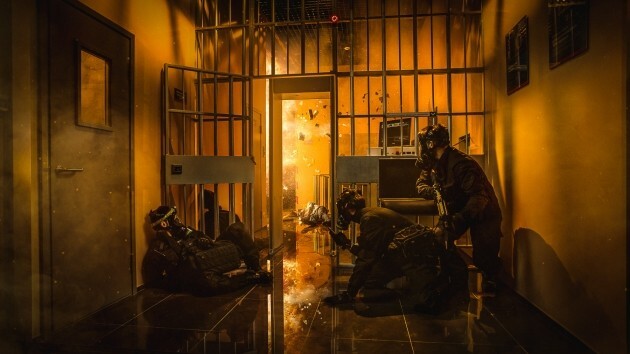 Escape room players want to be immersed in another world. 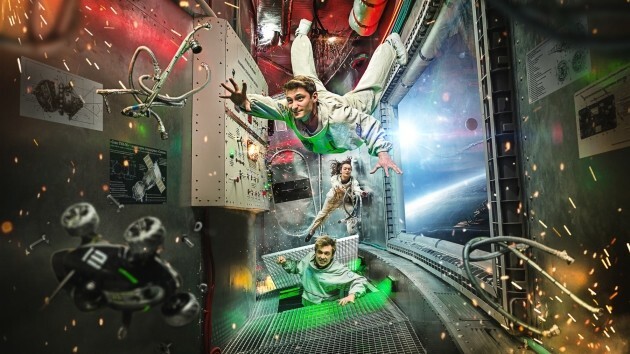 Show them the best, most imaginative version of that world in your escape room photographs. To do this, I use a wide shooting angle and the maximum possible detalization. Obviously, the better your escape room looks in real life, the better your photographs will turn out. Photos of well-designed escape rooms are much easier to stage because the settings are already so realistic. Over the past three years, I’ve seen many wonderful projects. They have all been united by the relationships between their creators and the final products. 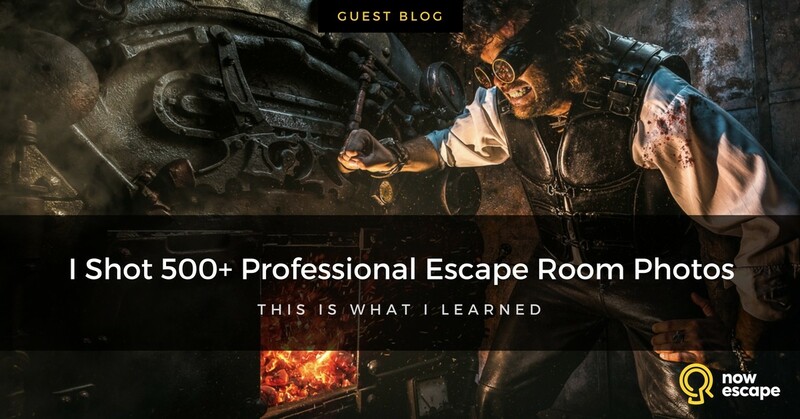 The most impressive escape rooms aren’t thrown together by business owners just looking to make money; they’re developed with a great love of storytelling and incredible dedication to creating immersive environments for their customers. When I meet with the teams behind these extraordinary room escape games, they always start by telling me stories of sleepless nights spent formulating and perfecting ideas, and nonstop days seeking out the best engineers, builders, and decorators. 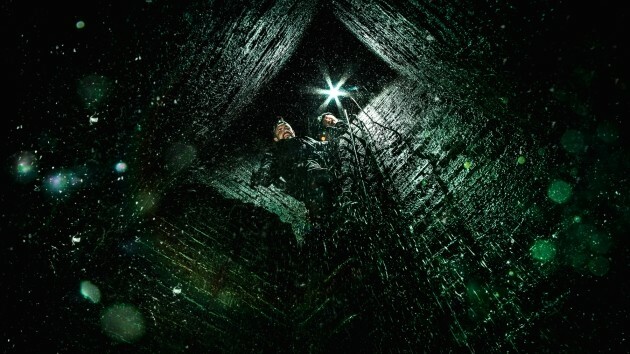 Some Claustrophobia franchisees have collaborated with cinema art directors, used theatrical props, and consulted with criminologists, doctors, and police. This all-in approach can be felt in every detail of the rooms they create. The teams that engage in this thorough, detailed planning provide the best customer experiences and have the highest rated rooms. Obviously, it’s only right to put the same time and effort into their promotional photography. You should approach your photography the same way. Your photos should show potential customers how realistic your set decorations and props are and how much effort has been put into every little detail. If you can add elements that aren’t actually found in the room, but which enhance the narrative – such as weapons, photography on the move, and special effects – do not hesitate to use them. 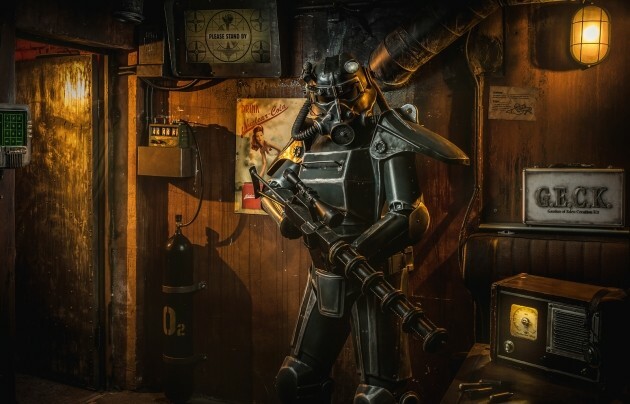 Although these elements may not be present in the real locations, they ignite players’ imaginations before they book and while they’re playing, adding excitement to the overall experience. It’s not just the scenery, but the escape room’s plot, that affects customer perception of your photographs. 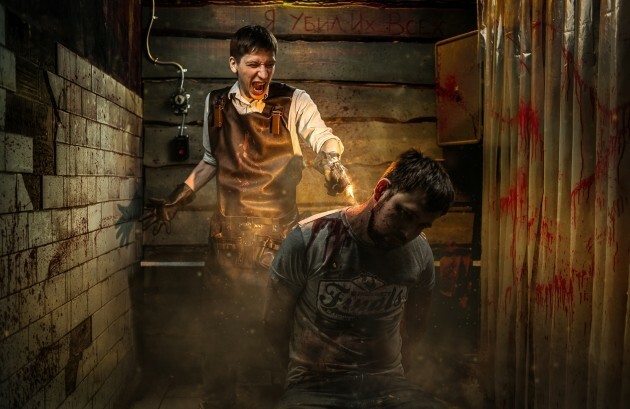 Before planning a photoshoot, escape room owners and I discuss the room’s narrative. We put together a script detailing the characters’ stories, including their behavior traits and clothing. We explore the types of patterns and images that will best reflect each room’s spirit. Your room’s theme will help determine what type of story you tell in your photographs. You’ll find that some settings are easier to create good narratives out of than others. 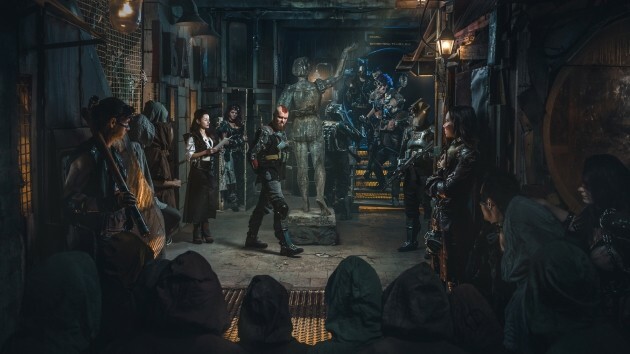 I’ve found that the most spectacular images come from escape rooms with unusual settings and stories: scary basements; caves; space stations; pirate ships; secret scientific laboratories; military bases; future, cyberpunk, post-apocalyptic bunkers . . . the universes of cinema and computer games. 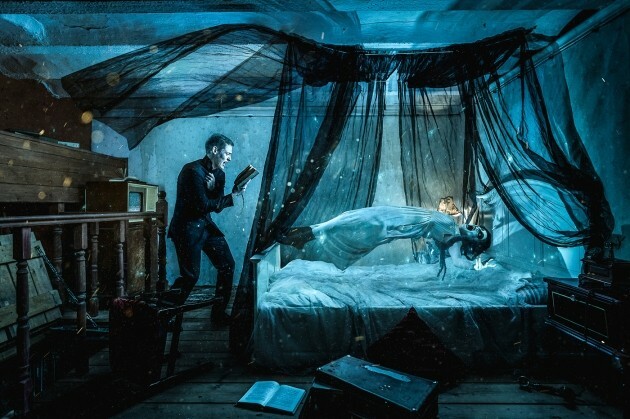 It’s a little harder to tell good stories with abstract subjects, like sleep, comas, purgatory, or digital worlds. The most difficult photos to shoot are of ordinary settings, like offices, schools, gyms, apartments, hospitals, and prisons because the stories that play out in such locations can be seen every day in real life. If you imagine the options, you can quickly see why one theme lends itself to narrative photography better than the other. 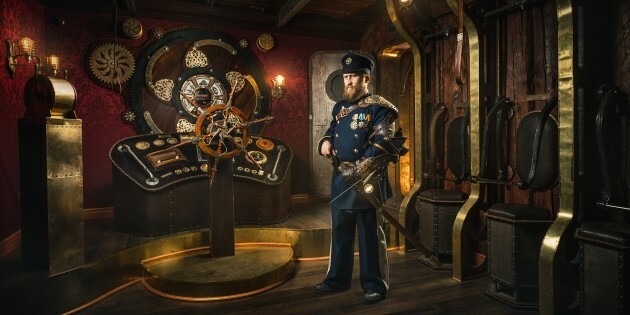 For the first room, you get photos implying that customers will experience an exquisite, steampunk adventure where they might find a man in a striking Renaissance costume trying to fix an exploding steam boiler. Photos of the second room show a museum with white walls, a couple of paintings, and a single sculpture. Perhaps a security guard in a standard uniform stands watch. Obviously the first option brings to mind a more exciting quest, even if both rooms contain interesting objectives and equally challenging puzzles. Rule 2: Always include people in your escape room photos. An image of an empty room – no matter how artistically you’ve shot it – doesn’t engage the imagination. When you add models to an escape room image, you complete the story, which is ultimately what your customers are looking for. When I started out (and this is a good strategy if you’re on a tight budget), I always used at least two models – generally a male and a female – and put them in active poses that suggested teamwork; interaction with mechanisms, puzzles, and hidden objects; unexpected plot twists; and of course, emotions. One simple and obvious rule to keep in mind: Customers see the models in the photos as virtual stand-ins for the people playing the game, i.e, themselves. Therefore, if you’re representing players in your photos, they should match the demographics of your target audience. 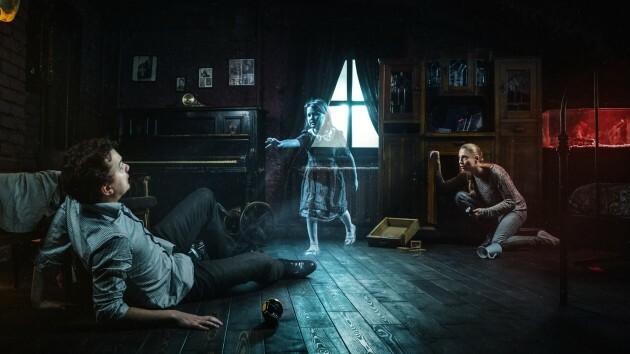 Once we shot a series of photos featuring a little girl in a horror-themed escape room. Simply based on this photo, customers thought the game was for children, despite the 18+ booking restriction and text-alert reminders not to bring children. Because of this, very few people were satisfied with that escape experience until we changed the pictures so they featured adults instead. As room narratives have become more complex, I’ve begun using actors to represent “non-player characters’ as well. 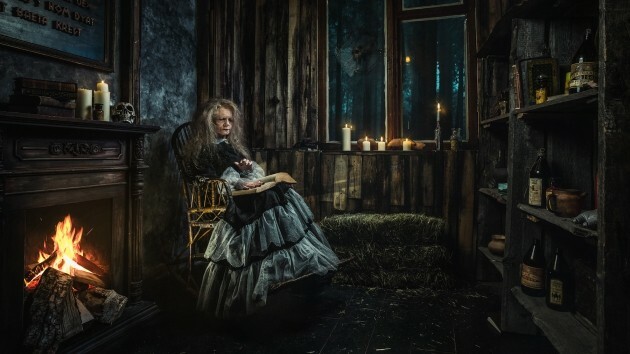 So, if the story involves an old charismatic magician, a witch, a knight, a maniac, or a mad genius, I now add that character to the images, as well. Of course, the actors within the image greatly affect customer perception. 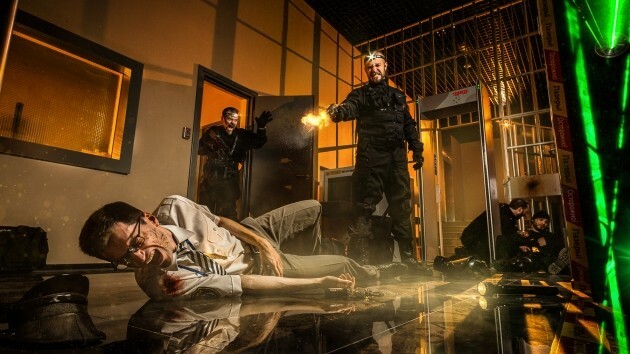 It may surprise you, but the professional photo models are almost never suitable for shooting escape room photos. 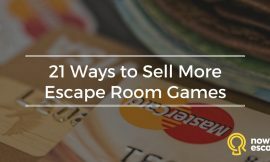 Marketing an escape room is nothing like advertising a car, a phone, or a trendy retail clothing outlet. 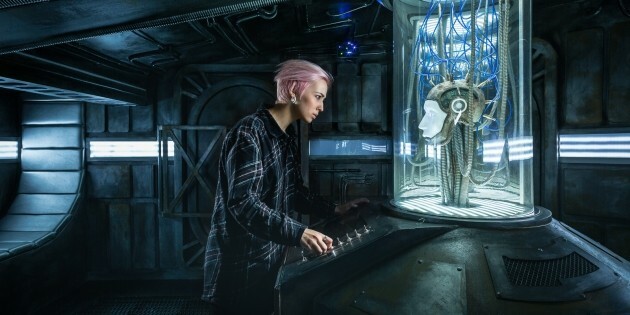 Many of the models you find through talent agencies are not used to the kind of acting required to create a truly realistic escape room scene. You need actors who can display realistic emotions, movements, and attitudes. If you have artistic friends who can help you out, this is the easiest way to recruit talent for your photo shoots. If you decide to hire professionals, seek out actors – or acting students – instead of models. They’re more likely to give you the performances you’re looking for, and they’re often cheaper as well! 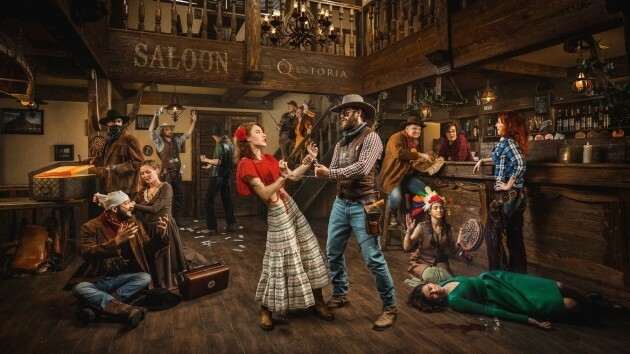 One other word of advice: If you’re taking photos to promote several different rooms, make sure you use different models for each one or change their costumes and makeup enough that they are not recognizable as the same people every time. You want each escape experience to exist within its own fictional universe; if the same people exist in all of them, it can spoil the illusion. Speaking of spoiling things, it should go without saying that you should protect viewers from learning the secrets in your escape rooms before they even book their games. To do this, I often change the arrangement of props throughout the room and deliberately show actors performing actions that players don’t make in the course of the game. 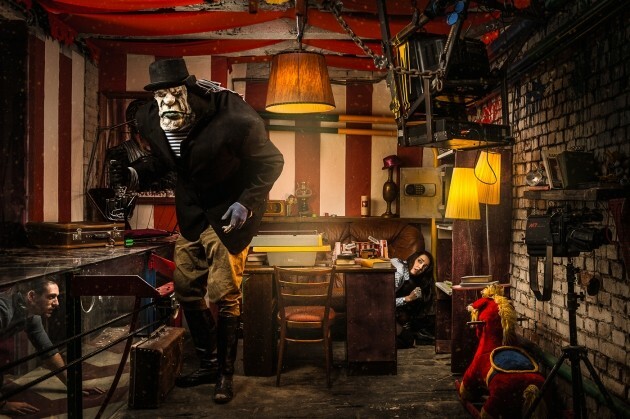 Rule 4: Hire a photographer who is familiar with the Escape Room industry. In order to unleash the full potential of the scenery, the plot, and your actors, the last and most important element is the right photographer. 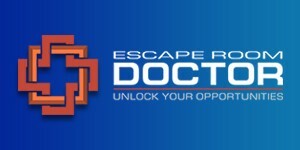 As escape games began to gain popularity, a lot of specialized artists appeared, including escape room designers, engineers, decorators, full-service consultants, franchisers, and more. But we didn’t see a lot of escape room photographers appear in the market. Unfortunately, photographers who work in other industries tend to run into unexpected challenges when asked to photograph room escape locations. For example, wedding photographers are used to working in well-lit venues and often don’t have the skills necessary to direct light for atmospheric effects. Professional interior photographers are not accustomed to directing the emotions of actors. Studio advertising photographers are used to working in large, clean environments that can accommodate a flash and large softboxes. 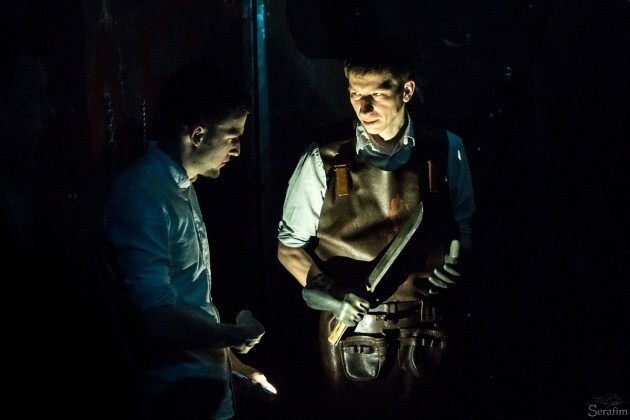 When these photographers face a photo shoot in which they must capture the fine details of a narrow, dark, dirty room with running water on the floor and an actor firing a gun, they are often unprepared. I was fortunate that I had the combined skills needed to photograph escape rooms. I also quickly developed my own strategies as I overcame hurdles. 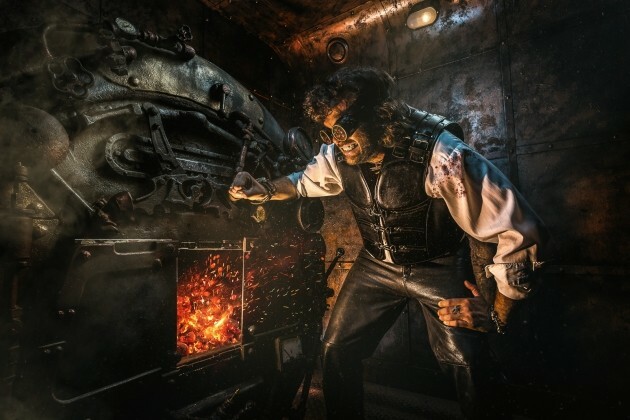 Don’t stop searching until you find a photographer who understands the challenges and the rewards of taking outstanding escape room photographs. Obviously, as escape rooms evolve, escape room photography must be adapted to meet new needs. The industry has not stood still, and photography has changed along with it. 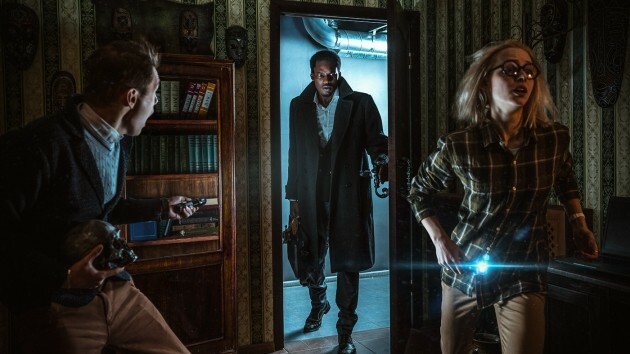 Escape rooms quickly inspired the creation of limitless new entertainment formats. 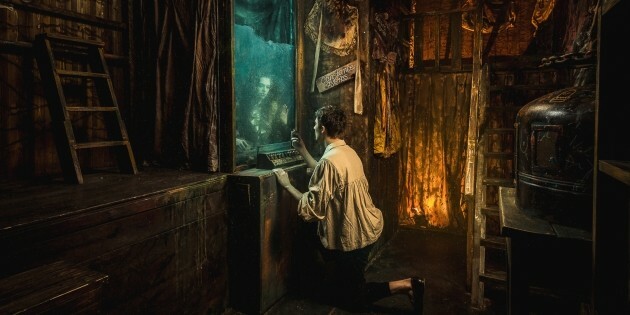 Today, immersive forms of entertainment have expanded to include such things as quests specifically for kids; partially or fully immersive theatrical performances (both on stages and in real locations); competitive real-life puzzle challenges; active games in which the atmosphere and story are more important than puzzle-solving; horror experiences involving interaction and even physical contact with actors; and more. These new immersive venues have opened a new creative landscape for me. Now I can expand the boundaries of what can be shown in promotional images, repeatedly violating my own rules. I’ve taken photos with 20 actors, instead of two or three. I’ve alternated wide-format with close-ups of emotions. The atmosphere of my pictures has became more dense and cinematic with dust, smoke, and dirt flying everywhere. I’ve experimented with effects, which are actually absent in the game – like water, blood, bombings, gunshots, and open fire – to create spectacular, cinematic images. Over the last three years, I have taken shots of over 150 different locations and faced a number of unexpected difficulties. Each time, I was able to find a solution and apply that new knowledge to future shoots. It was my goal to make the shooting process better and easier with each job. I plunged my head and my heart into this process. For me, this work is not just an ordinary career, but an opportunity to engage in real creativity on a daily basis. I love escape rooms – love them as much as the people who create them do. Not everyone manages to find this ideal balance between passion and employment, but when it happens, it’s the recipe for incredible happiness. That’s why when I began to tire of taking standard escape room photos, I began to abandon the work. Today, I typically accept contracts to shoot only those stories that surprise me – escape games or other immersive experiences where I find something new for myself. This approach is the only way to continue creating a unique product, and it applies whether you are a photographer, or you’re an engineer, a builder, a decorator . . . or the creator of your own escape room adventures. Ilya Nodia is an advertising photographer and retoucher who specializes in creating posters and cinematic advertising with models and actors. Ilya delights in working with escape game and quest companies, interesting projects, start-ups, and commercial ventures. He is available to collaborate in any country. Whether you’re just getting started or upgrading your existing website, making sure you have the right images to promote your business is essential. 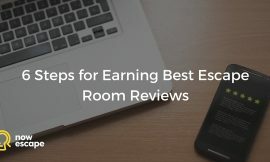 Nowescape offers additional articles on marketing your escape room and developing an effective website.